Flexible backing allows for placement on virtually any anatomy. Economical vs. other hemostatic dressings. 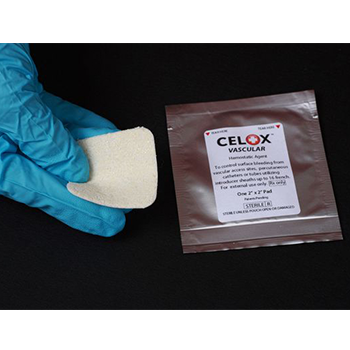 CELOX Vascular™ is indicated for the local management and surface bleeding from vascular access sites, percutaneous catheters or tubes utilizing introducer sheaths up to 16 French.